It’s a normal day where you’re going through your usual routines, when all of a sudden, you find yourself thrust into a dental emergency. Are you prepared to handle it? Is it your first impulse to panic? Your emergency dentist in Palm Bay says you should be prepared for such situations because they never happen when you expect them to. As you continue reading, he’ll discuss some of the more common types of traumatic situations that can arise and what you should do until you can be seen. Don’t Panic – As cliché as it may sound, it’s important to take a deep breath the moment you discover that you’ve had a dental emergency. This will allow you to think with more clarity and overcome the initial shock. Contact Your Dentist – The next step is to contact your emergency dentist to discuss what has happened so that you can get the guidance and relief you need. 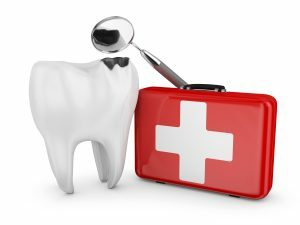 Are you unsure about what classifies as a dental emergency? Tooth Knocked Out – If you’re involved in sports, there’s a great chance of bodies colliding and you taking a blow to the mouth. If unprotected, you could lose a tooth from the impact. If this happens, wash your hands, grab the tooth by the crown (the larger, rounded portion) and carefully place it back in its original position. Broken Tooth – Sudden impact to your mouth can also result in a broken or chipped tooth. If this happens, you may experience some initial pain, but it will usually subside a bit due to the healing properties of your saliva that produce enzymes that coat the enamel of your teeth. Until you can be seen, though, be sure not to chew food on that side of your mouth. Excessive Bleeding – If you’ve recently had a dental procedure done or have sustained an injury to the mouth that has caused excessive bleeding, you need to be seen as soon as possible. In the interim, you can try cautiously biting down on a cotton swab to slow the bleeding. Toothache – A toothache is usually the result of severe infection that needs to be addressed immediately. You can apply ice to the area outside your face in 20-minute cycles and take ibuprofen for some pain relief. Also, you may try to carefully floss around the tooth that is producing the pain signal. No one wants to be involved in an emergency of any type, but since unfortunate situations are guaranteed to happen at some point in our lives, it’s helpful to know that there are safe ways to manage them. If you find yourself in one of the above dilemmas, don’t hesitate to contact your dentist in Palm Bay. Dr. Christopher Nowacki earned his DMD degree in 2004 and has gone on to provide his patients with expert care for over a decade. He combines innovative techniques, advanced equipment and a personable style of care at Beautiful You Dental and can be reached for more information through his website.